Quinn Rollins: Play Like a Pirate: LEGO Set of the Month: Mighty Dinosaurs! Yes, the Play Like a PIRATE LEGO Set of the Month is being revealed the last week in April. But hey, it's still April, and you've still got a chance to win. Details are at the bottom of this blog post. The set I've chosen for this month is 31058 Mighty Dinosaurs. This is part of the LEGO Creator line. Many of these sets (including Mighty Dinosaurs) have the pieces and instructions to build three different models. So you can build the Tyrannosaurus Rex, disassemble it, build a Triceratops, and tear that down for a Pterodactyl (I'm not even looking that up to see if I spelled it right, it's the flying one). Dammit I'm checking anyway HEY I SPELLED IT RIGHT! Even though I usually collect sets that are minifigure-scaled, coming with little dudes and dudettes, I love the versatility and creativity that come with these sets. 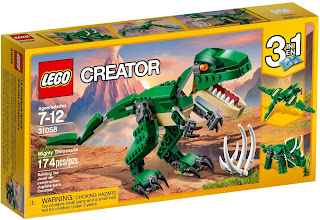 LEGO has a long history of building dinosaurs; my favorites were from the year 2000, which might as well be as far back as the Jurassic Period as far as trying to find them online. In more recent years there have been sets with Jurassic Park movies, but these rely more on pre-molded pieces that kids play with, but don't actually construct. 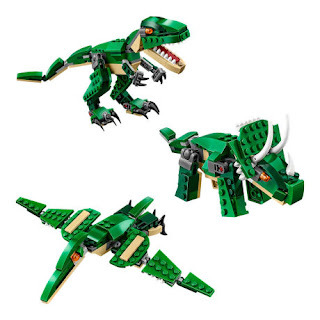 The Mighty Dinosaurs sets are things that kids actually build out of LEGO, meaning that those pieces can be reused in other builds as well. The last few years have seen a boom in new types of joints for LEGO, including some smaller hinges, ball-and-socket joints, and "click joints" that hold in place even with weight put on them. So these dinosaurs have great articulation and posability, so you're able to wreak mayhem wherever you want to. In addition to the three sets of instructions that come in the package, there are additional "secret" Brachiosaur instructions available free as a PDF on LEGO's site. For the record, almost all LEGO instructions are available on that site, so if you lose your booklet (or don't want to keep all of them around) you can find them there. Part the charm of the Mighty Dinosaurs and other Creator sets is that you're using the same pieces to build very different models. With only 174 pieces, you can build any of the three (okay four) models. That's easy with instructions, but students have a bigger imagination than the booklets do. A great activity with students is a LEGO challenge, where they have a set of LEGO, and a limited amount of time to build something after a certain theme. So choosing a theme from your curriculum (the water cycle, Mesopotamia, distributive property, the nervous system) give each child or group 150 LEGO pieces, and ten minutes to build their best representation of that thing. Give them specific parameters, or leave it completely up to them. They'll surprise you with the good things they can come up with. Even though my go-to advice with LEGO is keep the pieces as simple as possible (the standard bricks and plates), keeping some of the specialized pieces showcased in Mighty Dinosaurs, including hinges and joints, will open up the possibilities for your students, with new angles and moving parts and things you just can't do easily with the "regular" pieces. SO HOW DO I ENTER TO WIN THIS AMAZING SET??? UPDATE: Congratulations to Chris Heffernan -- you won the Mighty Dinosaurs! Some fine print: the LEGO Set of the Month will only be available to U.S. residents. Even though I love everyone on the planet, international shipping is beyond my reach right now. The drawing for the April LEGO Set of the Month will be at 10 AM MST on Friday, April 28. The drawing will be taken from all eligible entries with a random generator. So hopefully you win. Yeah, you.